Americans spend a lot of their time behind the wheel. As commutes get longer and longer and self-driving cars still seem a world away, it’s important to understand what causes car accidents and how to prevent them. A major reason people say they were involved in a car crash is because they were distracted. Now, it seems obvious not to drive distracted, but as driving seems natural and we do it all the time, people become too comfortable with the task and start becoming flippant about it. 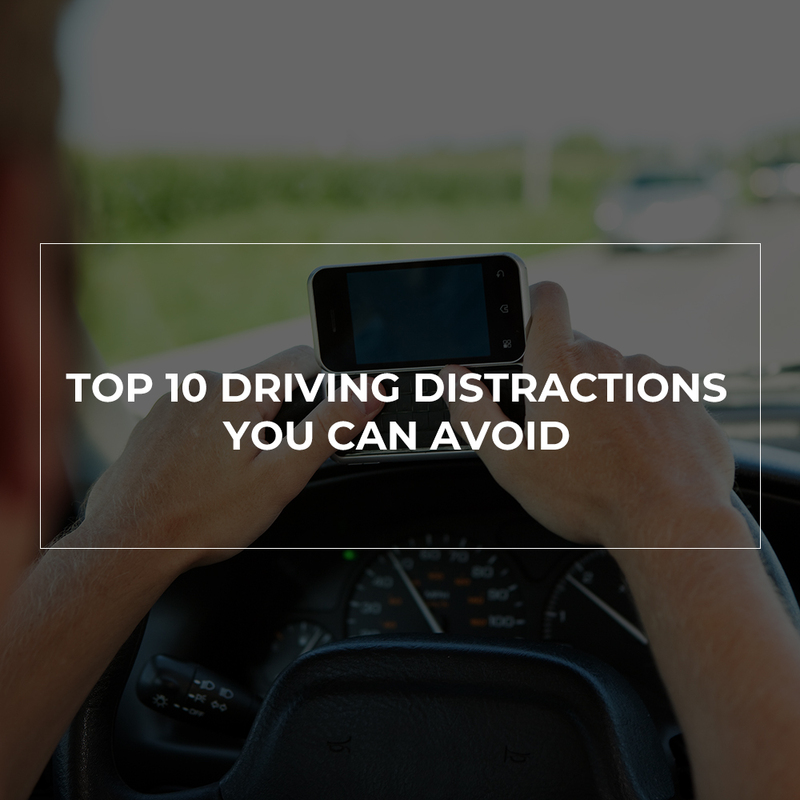 This article will cover the top ten driving distractions and how to avoid them and always remember to seek legal advice from an auto accident lawyer in Stockton if you have been involved in a car accident. Many young people get in car collisions while driving with their friends. Young people are less likely to understand the seriousness of driving and how dangerous it can be. They’ve been in cars their whole lives and being able to drive one unsupervised introduces a huge amount of independence, which can be very exciting. Young passengers may think it’s funny to play jokes on the driver or that driving is a great time to engage in a serious or compelling story. It’s important to realize that it’s okay to tell your friends to calm down and be quiet when you’re driving. Communicating over cell phone is more distracting than when someone else is in the car for several reasons. Other passengers are able to tell when the driver is focusing on the task ahead. The may speak freely while the driver is peacefully travelling down a straight road and will know to pause the conversation when the driver is merging or entering a high-traffic area. People on the phone won’t be able to understand that they may get frustrated if a driver pauses during the conversation for seemingly no reason. Another thing that makes cell phones distracting is their operation. Even hands-free devices can be difficult to work as the driver’s words may be misinterpreted, potentially causing panic and an even more dangerous situation. Avoid this by making all calls before and after driving and contact an auto accident lawyer in Stockton to learn what you can do if you were hit by a distracted driver. Texting may seem like something that can be done between glances at the road. This is an extremely common and dangerous misconception. Taking your eyes off the road for only a moment can result in an accident. Even if you just look at your texts and wait to respond, this takes attention away from the happenings of the road. This is a very easy distraction to avoid. Keep your phone in the glove compartment and on silent during your road. It’s okay to be unavailable for a short amount of time – it makes you seem more interesting, anyway! While a bad song or disruptive commercials can be distracting themselves, it’s even more distracting to try to fiddle with the radio to silent this disturbances. A good way to avoid this is to either have your passenger take on this role or to set yourself up with a playlist before hitting the road. Having good music can make tedious drives more enjoyable and keep you motivated to focus on the task. While it’s important to have music that you enjoy, being too involved in the music or other entertainment can cause you to lose track of what’s going on on the road. Showing off your dance moves or reacting to an outrageous audio book or podcast can result in a car collision by forgetting the actual task at hand. Avoid this distraction by specifically curating your entertainment so you have something interesting but not distracting. Americans are an on-the-go people. We’re always in a rush and off to our next task. Sometimes, our days can be so hectic that we don’t have time to sit down and enjoy a meal. Going through the drive-thru to pick up a sandwich for the drive is a tempting time-saver. It’s important to take the extra moments to finish your snack before hitting the road. You don’t want a tomato falling into your lap and making you take your eyes off the road. Having to adjust the airflow, seat warmer, and other car controls can be quite distracting. This is especially true if you aren’t familiar with the car you’re driving. Having to search for the control you need is even more distracting that simply turning a knob. It can be unavoidable and minimally distracting to simply press a single button when you know exactly where it is and what it will do. To avoid spending excessive time on the controls of the car, take a moment to orient yourself before the trip. This way you have a better idea of the layout of the buttons and you can identify the ones you actually are likely to use. If you or someone you know has been hit because of a distracted driver, you may be entitled to legal compensation. Contact an auto accident lawyer in Stockton today. Waiting until you’re on the road to do last-minute beauty maintenance is a bad idea. Combing your hair and wiping your face is a bad idea when you’re on the road. Though you may save a minute or two by performing these tasks on the road, getting into a car collision will surely take more time among other associated consequences. It’s inevitable that we’ll drive on an unfamiliar road or in an unknown city at some point. Checking your GPS and driving without knowing where you are can be dangerous and distracting. Be sure you know where you’re going as much as possible. Look at the instructions on your GPS before you start traveling. Pointing out landmarks to yourself can be helpful. For example, instead of thinking “turn left on Main,” noticing your favorite fast-food restaurant is on the corner can help you remember your directions and familiarize yourself with the area. If you do get lost, be sure to pull over before studying the GPS instructions. It’s hard to separate your emotions from the task at hand. While this may not matter when you’re showering or doing the dishes. Being upset while behind the wheel can be dangerous. Everyone knows the term “road rage” for its potentially serious consequences. Taking your emotions on the road with you can make you behave erratically and dangerously. Take a moment to calm down and focus on getting to your destination before you start the car. Perhaps you were in a fine mood when you got into the car, but traffic or other drivers have riled you up. Having a mantra to say to yourself may be helpful to keep calm. It may be difficult to have compassion for jerks on the road, but just imagine the car riding your bumper is trying to reach the hospital. Putting things into perspective and allowing yourself to let go of other people’s issues can help keep you safe on the road and calm in other areas of your life. Getting into an accident because of distracted driving is almost always a regret. Think twice before you partake in activities that can distract you from driving and always consult with a highly experienced auto accident lawyer in Stockton if you have been in an accident. Getting in a car accident of any size can alter your life indefinitely. At Sadiq Law Firm, we understand how emotionally and financially stressful it may be if you or a loved one was in a car accident. Give us a call at (209) 943-0000 to speak to an auto accident lawyer in Stockton.